Amy Korenvaes participated in an international Clown Care conference that was held last October at Ma’ale Hachamisha. Since then, she has been in touch with members of the Rofei Halom organization in hopes of starting a Rofei Halom project in Texas, and even raised funds for the cause with help of the Jewish community of Dallas. This week she arrived at ALYN together with Harlan Korenvaes, to learn more about the Care Clowns at the hospital, their continuous work alongside the rehabilitation team, and their contribution to the children’s treatment. During the visit, the guests were shown around the hospital by Naomi Geffen, Deputy Director General of Clinical Services. They spoke with Director General Dr. Maurit Be’eri about the project, and also heard from Physiotherapist Ofra Ginat about the unique collaboration between the Care Clowns and Physiotherapists during therapy sessions. 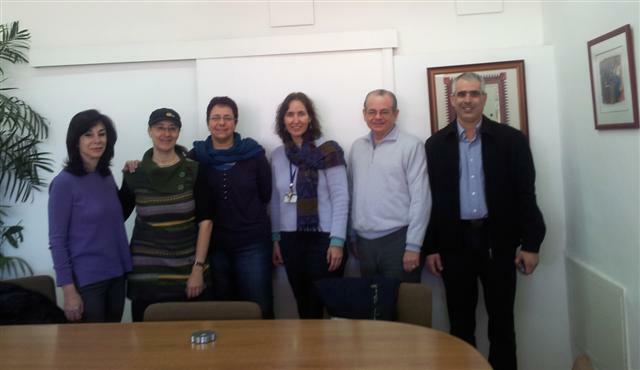 During a meeting with Care Clown Sigalit Ben Yehuda, participants Ruth Palmor – Head of Psychology overseeing the project at ALYN, Daniel Shriki – former CEO of Rofei Halom, and Shriki’s father who founded the organization, all learned about the important contribution of Care Clowns in motivating children during treatments. Ben Yehuda stated that Care Clowns reduce tension and enhance both the feeling of control and capability in stressful situations common during hospitalization and rehabilitation. The guests were impressed by the work conducted at ALYN in this field, and we'd like to wish them the very best on their journey.